I did thank Kim for this most excellent award nomination, but I haven’t gotten around to passing it on yet… and it may be a while before I do. So I thought I would share her nominations with you as they offer much needed information, and inspiring passion for those dealing with a relationship with a Narcissist and other types of abusers. You are your own best weapon against those who try to and do harm you, and the more knowledge you gather from others who have similar experiences, the more powerful you are, because their words and wisdom awakens your own inner words and wisdom. Break your silence and break free! Roar from your heart and let that roar echo loudly and proudly out into the world and touch others who also need an infusion of primal courage! 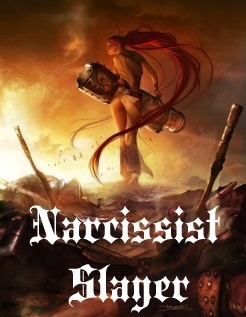 Thanks to my friend, Ursula, I was inspired to create the Narcissist Slayer blog award. Narcissists need no introduction. Once they’ve touched your life, you are changed forever. They literally strip you down to your deepest insecurities and slam-dunk you into misery and self-loathing; while they skip down a yellow brick road into the forest with Bambi.